It was around the 1940’s, while World War II was in full-swing, hopefully to be over soon. In America, soldiers would go to bars to flirt and have some fun before they got sent off to their next assignment. The ladies enjoyed themselves as well, but if a guy got too fresh with them, they had pointed hairpins that they could use to set him straight. At one such bar, a young man named John Thomas was socializing and having fun. He had his eye on an attractive lady with great legs. Claire Ewalt was sitting next to him, minding her own business as best she could in a noisy bar, until that clumsy guy accidentally spilled his beer on her fancy new green skirt. His attention tore away from the other woman, and he profusely apologized, offering to have her skirt cleaned. Claire declined his offer and said she would wash it herself. Unfortunately, in washing it by herself, she ended up ruining that skirt. But it did bring John Thomas into her life. One thing led to another, and they ended up falling in love. He wasn’t Catholic, so Claire’s parents didn’t quite approve. Love won, and they ran away together to get married in 1950. John and Claire Thomas began their new life together filled with the utmost love and devotion. He did end up converting to Catholicism which blessed their marriage with faith and love. Over the years, they moved several times as a military family, living in Illinois, London, England, elsewhere, and eventually settling in South Dakota. They had four children, one daughter and three sons: Cynthia, Lawrence, John, and Stephen. While they didn’t have a lot of money, they still maintained a life of simplicity, love, and a close family bond. As their children grew older and settled down with their own families all over the United States, Claire and John ended up moving themselves to Texas where they finally put down roots to remain. Throughout my life, they lived in the same house in a great retirement community with a golf course in their backyard. I always loved visiting them and can even remember the welcoming smell in their house. My family and I lived in Saint Louis, Missouri, so it was a lengthy drive, but I always looked forward to visiting with them. 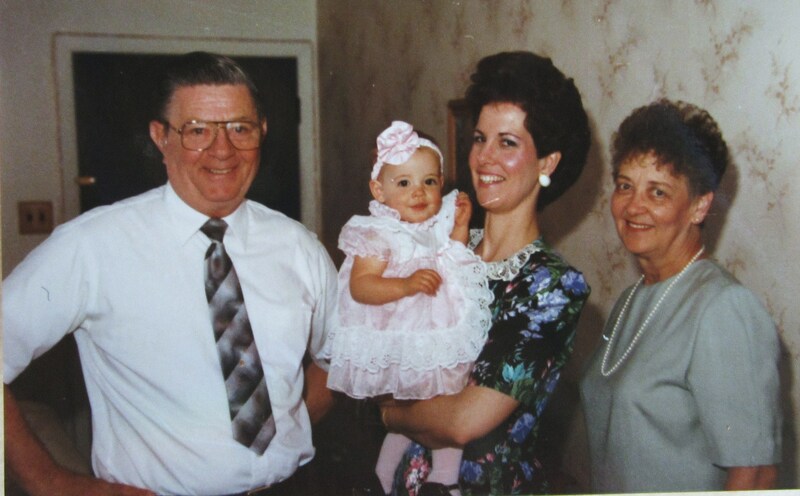 There’s even a family video recording of my grandparents meeting me for the first time after I was born when we flew up for a family reunion in South Dakota. My grandma had tears in her eyes as she welcomed me. As a child, my brother and I would play dogs with my grandma and grandpa. I can remember with fondness how compassionate and loving they were. It was always a great treat when Grandpa and Grandma Thomas came to visit. Throughout my adolescence they were always so supportive of me and were always so proud to hear about my accomplishments in school, band, choir, theatre, and beyond. They were even able to attend my Senior Vocal Performance Recital, which was the culmination of my Bachelors degree in Music at Webster University. The love between my grandparents was always visible. They were always holding hands, placing their hand on the other’s leg, stealing kisses, and being affectionate with each other. I remember one time while we were driving somewhere with my Dad and Grandpa in the front while Grandma and I were in the backseat. Grandpa reached back to caress his wife’s leg, but he didn’t look behind him, which caused him to touch my leg instead. I cleared my throat and said, “Grandpa, I think you’re touching the wrong leg. That’s mine.” It was a funny moment. My Grandpa always had a positive attitude. He was silly, laughed all the time, and created different voices and sounds to put everyone in a good mood. In all my time with him, I never saw him complain once. He was completely devoted to his wife. He was an admirable man with quiet strength. When my father played the guitar during their visits, my grandpa would always chime in singing. I last visited my grandparents in 2012. It was after that time in August that my grandpa’s health began to steadily decline. They moved to a nursing home where he could receive more care. In December of 2013, he was hospitalized for serious issues, and we thought that we would lose him. But he surprised everyone and held on. Over time, he gradually lost the ability to speak coherently. My family would FaceTime Grandma, and she would include him in the video calls. One Christmas, we called them, and I sang “Have Yourself a Merry Little Christmas” for him. He opened his eyes to listen. It hurt to see his health declining so much. Last Sunday, on the day before my father would go into surgery for a major spinal fusion, we received word that my grandpa, his father, had passed on to Heaven. We were in the middle of Costco shopping for our dinner that night. We all just formed a big group hug and cried together in the middle of the store. And that night we grilled some great New York Strip Steaks with salad and red wine, toasting a great man. His body was blessed, and he will be cremated. He will be buried in a major cemetery for veterans in the Dallas area. That internment ceremony will be next year when my father is able to fly to be with his family. I’m very glad that they will be waiting for him to be there along with everyone else. I wish I could be there too, but France is very far away, and I won’t be able to afford the plane ticket. I haven’t had the chance to really and truly cry and grieve the passing of my Grandpa Thomas, but I wanted to take the time and write a brief account of the love story between my grandparents that lasted 65 years. Their story and enduring love is an inspiration for the entire family and everyone who knew them. I can only hope that my marriage will endure all those years into the future as well. I never knew my maternal grandfather because he died the year my parents married in 1984, but I had the privilege to know John M. Thomas throughout my 25 years of age. I will miss him dearly, but I know that he is in a much better place at peace and able to run, jump, laugh, and speak in Heaven. He is no longer suffering and in the arms of his Father.